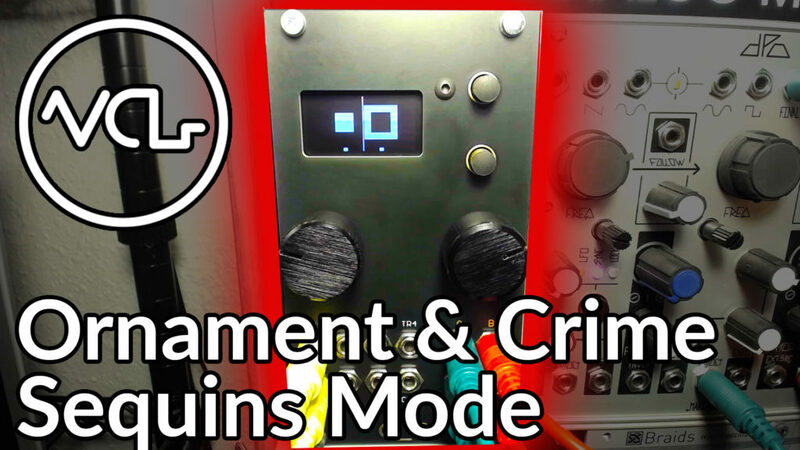 We’ve looked at a ton of the modes in the amazing polymorphic Ornament & Crime, from quad Turing machines to quad quantizers to quadrature LFOs… Now we return to the module to learn about a newer mode, the dual sequencer called Sequins. Unlike many of the other modes in the Ornament & Crime, Sequins is not four identical functions in one but rather two complex but identical CV and gate sequencers. The mode incorporates elements of other modes that we’ve examined before, like the pitch quantizing and note masking functionality of Quantermain mode. In fact, the sequencers can quantize to one of the dozens of internal scales, user created scales or disable the pitch correction altogether for microtonal, non-traditional sequences. Each channel contains up to four different two to 16 step sequences, which can be chained together to play end to end for up to 64 step sequences. This chaining action can be engaged using triggers as well. Sequences can be played using CV address of sequence position, utilizing the CV inputs on the module to send a voltage source in to shift the sequence. The patterns have different playback modes, allowing for forward, reverse or pendulum ping ponging of the sequence, as well as pattern randomization and brownian probability, setting the chance that the sequence direction will reverse with each passing note. Another important feature of this mode are the assignable C and D outputs, which default to gate sequences for channels A and B respectively. These outputs can be adjusted to output copies of the A and B sequences instead of gates. They can also be repurposed as envelope generators, saving some extra modules and giving the sequence even more flexibility. You can watch the video for more details, but this latest update to the firmware (version 1.3.3) seems like a major step toward the refinement of the module. Note when you update your firmware, the hex file capacity is at 100%… They are really cramming as much functionality as possible in to this beast. How are you using Ornament & Crime? Tell us about it in the comments!